I was having a conversation with someone a few days ago about the amazing human capacity for healing. Human beings self heal from colds, the flu, even cancer. Outside agents, whether it’s a chiropractic adjustment, drug, herb, salve or tonic only stimulate the inherent nature of the human being striving for health and wholeness. That is the paradox. We are self healing, and outside agents stimulate the healing process. How Do You Know When You Are Ready For More? If you are a high performance athlete there is a delicate balance between highly trained and overtrained, which leads to being ill. One tool athletes have used for 30 years is Heart Rate Variability. High Heart Rate Variability is a measure of Nervous System flexibility and adaptability. When it’s high you can train harder, run longer or faster and because your body is in a healthier state it will respond to the stress of training positively. When your Heart Rate Variability is low, light training or even taking a day off is recommended as your body is struggling with the demands placed upon it, and it is having difficulty getting to the state of Rest, Repair and Rejuvenate. This recent study looks at the benefits gained by those who trained less, but listened to their body, and had greater gains than those who followed a pre-outlined training plan. Can Everyone Benefit from This Tool? You don’t need to be an athlete to learn to listen to your body. Heart Rate Variability is something you can check on your own, with your smartphone and a $40-$60 Heart Rate Monitor. In addition to exercise, life stresses can lower your ability to Rest and Rejuvenate. If you know where you are, in relation to your Normal, you can take proactive steps to keep yourself healthy, or know you can take on an extra project, or walk an extra mile with a friend. PS – I will be on Spring Break next week (March 27-31), my office will reopen Apr. 3rd. A recent review of 33,000 cases of Back Pain in New Hampshire, those that utilized chiropractic care used 56% less opioids than those seeking other treatment options. The last time I was prescribed, or took, any pain medication was 1994 after a biking injury. I took one dose the first night so I could get some sleep. The next day I had my spine adjusted, this alleviated some of the pain and I was able to sleep without any medication from there onward. If someone you know is in pain, let them know there are options like Chirpractic or Accupuncture. Spinal Adjustments shift the state of the body from “flight or fight” to “Rest, Rejuvenate & Recover”, allowing you to recover from injury and chronic conditions. Although not mentioned in the book, it reminded me of the story of the Pennsylvania town of Roseto. Although the members of the community had similar demographics to neighboring towns, they demonstrated lower disease rates. The researchers noted a stark difference in the structure of the community. Most of us have moved away from our birth families, which gives us the opportunity to choose our Tribe. Finding people who have had similar life experiences offers health benefits on many levels, seek your Tribe and enjoy the benefits. Get Back to Normal or Get Better Than You Ever Were? Getting back to neutral, or where you were before is exactly where you want to go when you have pain or discomfort. Once you are back to normal, are there steps you can take to optimize? This is the question that comes from seeking high-level wellness. When you read about stress, we often hear of the “fight or flight” response to stress. It is the natural instinct for self-protection, we either hold our ground and fight or flee an attack. Human beings have at least 3 other responses when faced with a challenge. This mechanism is used by the Opossum in response to physical danger. It goes limp, and will appear to be dead. In Humans, this strategy is recommended if you are attacked by a bear. This strategy is mostly seen animals that display dominance or a pecking order. the less strong will submit, it allows them to live, and gain strength until they become the elder of the tribe. The flow state was brought into modern lexicon by the author Mihaly Csikszentmihalyi, in his book Flow: The Psychology of Optimal Experience. In this state, there is a stress, a threat, or an increased demand on your body or mind. Instead of narrowing the focus inward, or protecting, there is an expansion of energy with a continued “flow” to the higher centers of the brain. People in “flow” report a slowing down of perceived time. This state can be also be associated with enhanced creativity and peak performance. How can we get into a flow state? Through training we can learn to be in the flow state. Picture yourself in second grade, standing in front of the class, giving a short presentation in science class. Everyone is looking at you, you start sweating, your words aren’t coming out of your mouth like they would in normal conversation. These are classic signs of your body unconsciously trying to protect yourself from a different or strange situation which can be perceived as a threat. This happens even if the situation isn’t dangerous. Now fast forward 30 years, you have done countless presentations in high school and college, you have been on job interviews, pitched business ideas to potential partners, and have become skilled in public presentations. You are asked to give a speech about something that is very important and you are passionate about it. The outcome of the talk will affect many people. Even with this challenge, you rise to the occasion, maintain a sense of calm, focused power through the presentation. This can only happen by learning to acknowledge the subtle signals of your body, and acting in a way that leads to flow. It will feel very odd at first, as we are acting against natural instincts. We can train our body/mind to do something different, when instinct is telling us to stick our head in the sand and just wait for the threat to pass. Flow doesn’t usually just happen, this state must be cultivated. With Network Spinal Analysis Care, this state is cultivated around 3-6 months into care, as your body doesn’t go into protection anymore when challenged, you begin to set new standards for yourself in regards to your energy state, your attitudes and actions. It’s the middle of February in central Virginia. Our winter has been unusually warm, spring bulbs are blooming, cherry trees are blooming and as I was walking home for lunch today I noticed a Maple Tree dripping sap on the sidewalk. Compared to an “Average” winter, these signs of spring are 4-6 weeks early. Can Nature Be Confused? Are the plants wrong in flowering now? We understand plants, trees and flowers respond to their environment, they sense temperature, amount of daylight, mineral content, moisture levels, and more. When the conditions are favorable for growth, they grow, when the conditions favor dormancy, they go dormant. As far as we know, they cannot read a calendar. Plants, flowers and trees cannot delay a natural impulse when all the conditions are met. How does this relate to your body? We have inborn drives to grow, heal, think, create, digest, breathe, and more. Every action, thought, behavior can be supported to the point where it bursts through and cannot be stopped. Nature isn’t confused at all, it is currently being supported to grow and bloom. What are the actions, thoughts and behaviors that support your health to bloom? If you supply your body and your environment with everything that supports health and wellness, your body will respond in the only way it can…it will be unstoppable. Can Choosing a Different Word Affect Your Outlook? Robert Cialdini’s first book was called Influence, which discusses things that go on beneath our conscious awareness that ultimately influence our decisions. Of all the things he researched over the years, he didn’t put much thought into word choice. At first he thought, “Geez, this is silly” when asked to use the alternative words, but now he calls himself a convert, especially after looking at the research on the subject. As a healthcare organization, this group decided they weren’t going to let anything get in the way of a healing environment for their employees or patients. Can you make that same commitment? Can you make the commitment to yourself? Be mindful of your self-talk, find words that support achievement like attain, succeed, master. Making this slight change can make a big difference, try it with me, and let me know how it works. In the 1980’s, Dr. Donald Epstein realized some of his patients had gone beyond the model of the typical patient. They weren’t looking for a cure or a fix anymore, they were taking action in many areas of their health and well-being. They started new diets, left unsupportive relationships, and started exercising, just to name a few changes. The term Practice Member was born out of this realization that something was different when people started taking a more active role in their health and well-being. The concept of “Patient Activation” was studied by a UK health management consultant. They found in people with the highest levels of involvement in their health, called “Advocates”, had 9-20% lower healthcare costs per year. That is astounding! In the report, the authors see distinct levels of engagement and understanding of their health, going from “Believing Health is Largely Out of Their Control” to “Maintaining a Healthy Lifestyle as a Key Focus”. If you are still in the place where you believe health is largely out of your control, consider a different perspective. We can control many things, and all of these can lead to greater health. Our DNA is just a blueprint, and we control the finished product by what we eat, what we think, how clean our air and water are, and much more. The choices you make can lead you to becoming your own Health Advocate. When I was young, it seemed like I learned something new each day. Sometimes we stop learning, and we fall into familiar patterns of behaving, thinking and feeling. I could see how this way of being would lead neuroscientists from an earlier time to think the brain couldn’t change after a certain age. This was the common thought in the field of neuroscience through the 1990’s. Dr. Leaf mentioned a very special teacher who encouraged her to go beyond what she knew. Holding the space as a teacher for your student to go beyond what you know is an incredibly powerful concept. It was also interesting to hear her perspectives on changing patterns. Maybe you have heard the phrase that it takes 21 days to establish a new pattern, or eliminate a non-productive pattern? Dr. Leaf said this was true, and also when you continue the new behavior for 2 more cycles of 21 days, then you have built a new pattern that is strong. If you tried to change a pattern for the New Year, how is it going? Did you notice any resistance around day 4? Dr. Leaf discussed that Day 4 was often the hardest when you are trying to change a pattern. I personally got a lot out of this interview, and I hope you do also. P.S. Thank you to my practice member who suggested I look up Dr. Leaf after a conversation about one of my previous newsletters. How can we dream a better tomorrow? This weekend we honor Dr. Martin Luther King. When you hear his “I have a dream” speech, do you ever wonder how human beings have the capacity to visualize something that has not yet happened? Another word for being able to visualize the future is called consciousness, and the study of what makes one conscious has vexed scientists for years. Recently I read this article that puts a few more pieces of the puzzle together. http://bigthink.com/philip-perry/harvard-researchers-have-found-the-source-of-human-consciousness I hope you find it as fascinating as I did. How can we dream a better tomorrow? According to the latest research, it starts with connecting the brainstem to the prefrontal cortex via a neural network. Neural networks are built through our life, and strengthened with use. Michio Kaku calls the human brain a prediction machine. Based on previous experiences, we can predict what might happen, and we can also see things better than they are in the moment, and then start working toward that goal. Said in another way, how we experience events is partially based on our current state. Or, how we remember the past, is based on our present energy state. Researchers also discovered these elevated states of high emotion prime the brain, and those effects improve your cognition of non-emotional events. Knowing this, you can use this to your advantage. If you want to remember something or be more engaged, put yourself into a higher emotional state before you learn. You can prime your system with images of beautiful things or loved ones. You can play or sing inspiring music. For instance, Tony Robbins starts each day “Priming” his physiology with high energy appreciations. We cannot change the external world, “events” happen, but we can choose the type of thoughts, and emotions we have. We can choose the type of people in which we surround ourselves, we can choose the type of media we engage with. Each of those choices either puts us in a high emotional state of happiness and appreciation, or an emotional state of depression and withdrawal. Which will you choose? When you change your actions/behaviors, you change the biochemistry of your brain. Neurotransmitters start firing in new areas, changing the function of your brain. Changing the function over time will change the structure of your brain, new pathways are formed. This is how you change your brain. Your Brain is changed every time you learn something new. Listen to Brain Researcher Dr. Lara Boyd from University of British Columbia in a TEDx talk titled “After watching this, your brain will not be the same.” In addition to describing the process of how to change your brain, she also talks about the common misconceptions about the brain, and how different people learn differently. How Can My Newsletter Help You? Each week I listen to podcasts, watch TED talks, read published journal articles in the areas of health, personal growth, diet and nutrition, psychology, and more. What would you like to know more about in the next year? What will make the biggest impact in your life? Please follow this link to a short survey. Introducing a yearlong program looking at all aspects of your life – physical, emotional, professional, and more. Treating Muscles Via Your Mouth? It’s the middle of the night, as you roll over in bed you stretch out your feet a little bit and, your calf is in spasm, a muscle cramp as taken over and you just want it to stop. It can be very painful, and it’s not a normal function of the body for muscle groups to be in spasm, so what is going on? Often a spasm will occur when the muscle is overworked, but not all overworked muscles go into spasm. Pressing, rubbing or massaging the muscle doesn’t seem to affect the spasm while it’s occurring. There is another process occurring. This process begins in the spinal cord. Motor neurons control muscle activity. In order for the muscle to continuously fire, the signal has to come from the spine, muscles do not work on their own. Knowing this information, the question of “What if there is a way to break the pattern by stimulating the brain?” came to a researcher after a long distance kayaking trip where he and his fellow traveller were both struggling from spasms. His specific niche of research was imaging ion channels in the tongue, esophagus and stomach. He theorized that a stimulus to the brain via these channels could shut down the pattern of firing in the muscle group. His solution; A liquid tonic with spices like ginger and capsaicin, which in his research had a positive effect on muscle cramping, both in preventing them and helping alleviate them once they had begun. After hearing about this for the first time this week, it reminded me of the Russian researcher A.D. Speransky, who was a student of Pavlov. In the 1920’s Speransky was also able to demonstrate that pathological states could be interrupted and health returned not fighting the irritant but by changing the state. Not fighting the irritant, and stimulating the nervous system to return to a healthy state is a core concept of how I analyze the spine and nervous system. Instead of forcing an area that is tight, stuck or not flexible, the system can be coaxed to self-asses it’s own patterns and develop strategies to release the tension and return to a more sustainable pattern. A few weeks ago while listening to a talk given by Adam Reiss on the Expanding Universe, he described findings that changed how we understand the universe. Those findings won his research team the Nobel Prize in 2011. Working in other places around the world, another team had similar findings. The discoveries of both teams occurred within months of each other. It appears that once something is known to enough people, that information is soon available to larger and larger amounts of people. Using a computer analogy, once the data is “in the cloud” it can be accessed by all of humanity. In the world of sports, the record for the mile run stood just above four minutes for over 30 years, and within four years of Roger Bannister breaking the four minute barrier, four other athletes also broke the four minute barrier. It seemed that once people knew it was possible, it didn’t seem like a barrier. This trend also appears to favor increasing understanding, increasing performance and increasing ability for compassion. For more about the theories of Morphic Resonance and Field Effects in biology and sociology, look up Rupert Sheldrake. Can Well-Being be your Addiction? Addictions start because your brain is flooded with the “feel good” chemicals like dopamine and oxytocin. Pleasure or reward centers in the brain are activated. Legal and illegal drugs activate these centers, as does sugar. Also love, connection and helping others activate these centers. As we approach Thanksgiving, notice the good feelings you get when you give thanks, when you think of others, and when you help others. These habits that reward our brain with the feel good chemicals can become our addiction where we seek the boost that occurs in our physiology when we give. This is a phrase I often hear after I assess someone’s spine for the first time, especially if it’s about an event they haven’t yet shared with me. In many ways your body can be read like an arborist reads a tree (although I don’t have to slice a person in half to do it). We “wear” our stresses in our body. We see it in posture and facial expressions. Below the surface, there is more. When I feel someone’s spine some of the things I’m assessing are Connective Tissue, Muscle Tone and signs the spinal cord may be torqued. The shape, position, tension and tone of your spine tells me about what is presently going on in your life, and has gone on in your life. What your connective tissue “Tells Me”: The connective tissue of the spine, when healthy, feels supple, and fluid. When unhealthy, it feels rigid. Connective tissue is related to a sense of safety in the environment, and your body’s basic system of making energy out of the building blocks of life. Connective tissue that is healthy “Tells” me you can generate the energy your organs and systems need to survive, heal and grow. It means your brain and nervous system tell your body that “all systems are normal”. When the connective tissue is unhealthy, it is a sign your system senses danger, and the order of the day is to protect vital energy because there may not be enough for us to survive. We are on high alert to stay away from any more danger. This makes it difficult to feel peaceful or at ease. Our body may not be digesting our food as well. Because most of the basic functions of the body are automatic, or not controlled by thought, you may not be aware unless someone else points it out, or you take an inventory of your energy levels consistently. So, How Did I Know? Your body tells me. Vote Today, Vote Tomorrow, Vote Tuesday, Vote Everyday! Every 4 years the United States chooses a president with their vote. Everyday we vote by where we place our attention, our time, our money and our energy. 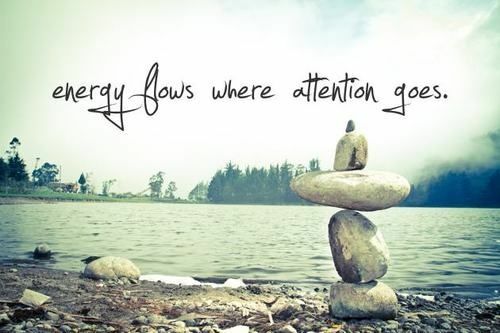 When we place our focus upon something, it builds the energy, assisting its growth. What happens when you stop paying attention to your garden or your diet, or your relationship? It usually loses momentum, and show signs of breakdown. What do you want to restore, heal or grow? Maybe it’s your posture, your joints, your digestion, or your happiness. When we focus our attention outside ourselves we vote for change by what we buy, by writing letters to the editor, or attending public meetings and sharing our concerns. We vote by talking to our neighbors and building strong communities that care for each other. This is the vote you can place every day. Place your vote for yourself by attending my free workshop Tuesday, Nov. 8th at 6 PM at Integrated Life.